Analog computers are based on principles completely different from digital computers. Problem variables are represented by electrical voltages which can vary continuously within a certain range, usually -10 to +10 volts for a transistor-based machine. Electronic circuit modules allow the variables to be added, integrated (with respect to time) and multiplied by a constant. This makes it is possible to solve a system of ordinary linear differential equations by properly combining a number of adders, integrators, amplifiers and potentiometers using flexible chords and a patch panel (see the examples). Large machines like the EAI 680 also support non-linear operations: square-rooting, arbitrary (piecewise linear) function generation, multiplication of two variables, and comparing the values of two variables. The last mentioned operation results in a boolean quantity which, perhaps combined with other boolean results (using the machine's patchable logic circuitry) can be used to change the 'program' dynamically. For instance, the simulation of a bouncing ball requires the solution of one differential equation when the ball is in free fall, while another equation (describing the forces occurring during elastic deformation) is applicable when the ball is in ground contact. The results of the computation can be shown graphically, in real time, on an oscilloscope or plotter, or be digitized for being stored or further processed by a digital computer in a hybrid system. Also the results can be used directly for the control of some physical process. left: Antikythera, Greece 100 BC (photo wikipedia). right: Astrolabe, Augsburg 1610. Kunstgewerbemuseum Berlin (photo E.H. Dooijes). 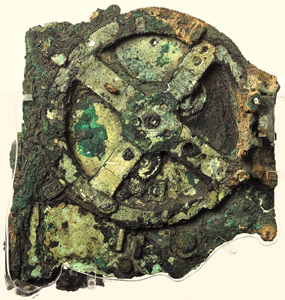 Early special-purpose analog computers were the ancient Antikythera, the astrolabe of the Middle Ages, the slide rule, the curvimeter and William Thomson's mechanical tide predicting machine . The principle of the mechanical integrator has been described by William Thomson (Lord Kelvin) and his father James Thomson. Integration was needed in the planimeter, the harmonic analyzer, and for the solution of differential equations . 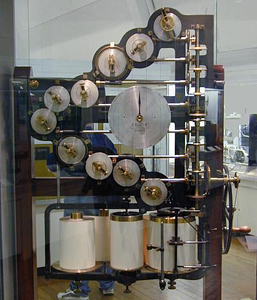 Thomson's mechanical tide predicting machine, Science Museum London. General-purpose mechanical analog computers ("differential analyzers") based on Thomson's principles were built in the 1930's by Vannevar Bush (1890-1974) at MIT. In World War II, analog computing mechanisms were of great importance for gunfire control on warships (picture below from ). The paradigma of the differential analyzer strongly influenced the architecture of the ENIAC, which was indeed designed to replace the Bush differential analyzer for doing ballistic calculations towards the end of World War II. These mechanical systems were gradually replaced by electronic machines, first with electron tubes, later with transistors. Early special-purpose examples are the TRIDAC aircraft flight simulator (1956) and the Deltar tide simulator (1961). General-purpose analog computers, programmed by way of patchboard wiring, and sometimes in combination with digital computers, were heavily used until well in the 70's for applications like automobile suspension design, chemical process simulation and control, experimentation with 'world models', Apollo spacecraft flight control, and many others. While the analog computer was ideal for the fast solution of differential equations (because all operations are effectively done in parallel), very expensive parts and construction techniques were needed for obtaining a reasonable accuracy of the solutions. Therefore the analog computer was quickly superseded by the digital computer in the late 70's. Numerous programming systems were invented to emulate the analog computer on a digital machine: examples are CSSL (Continuous Systems Simulation Language), and TUTSIM, developed at the Technical University Twente (The Netherlands). An early version of TUTSIM is running on one of the Museum's PDP-11 computers. The analog computer paradigm is still alive; a graphical programming environment for simulation like MathWorks' Simulink is built on the idea of patching together functional units, with virtual wires, for solving a given problem. 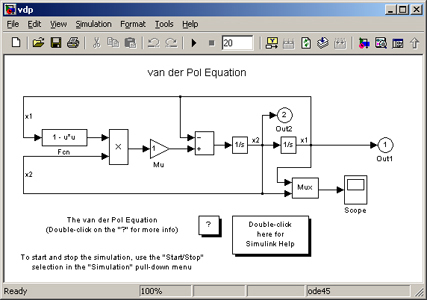 Screenshot of a Simulink program. A basic building block of the analog computer is the operational amplifier which is used in almost every functional unit (adders, integrators, etc). It acts as the heart of an electronic servo mechanism which (in an adder) turns the virtual knob of the output voltage source in such a way that the output voltage is accurately equal to the sum of the input voltages. The operation amplifier (featuring a very high gain, high input impedance and low output impedance) is still heavily used today - in a miniaturized version - in a large variety of electronic circuits among which artificial neural networks. 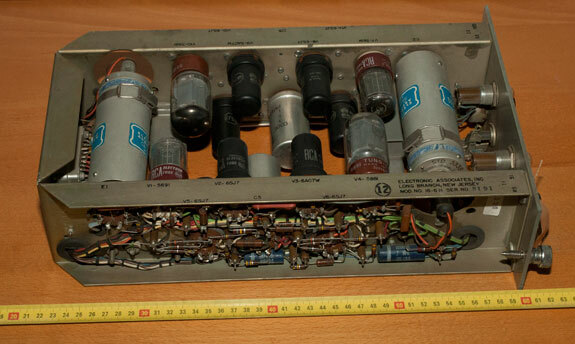 Dual electron-tube opamp by EAI (early 1950's). The large aluminium cylinders are 'choppers'. The unit's weight is 4.4 kg. Some operational amplifiers made by Philbrick Researches. 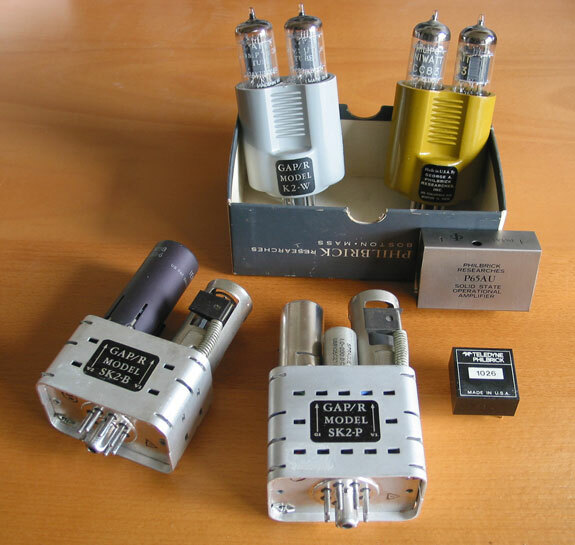 The two smaller opamps are built from discrete transistors. A. Svoboda: Computing mechanisms and linkages. MIT Radiation Laboratory Series no.27, McGraw-Hill 1948. W. Thomson, Treatise on Natural Philosophy Vol. 1, Cambridge 1879.